I’ll be honest. After the first exhausting day of riding and filming CycleOregon, I didn’t think I would make it through the week alive. We had brought a week’s supply of 5 Hour Energy and it wasn’t looking like it would be enough. 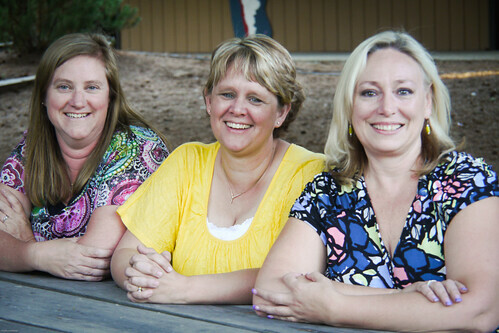 A week before we even made it to the start line, Laura was making phone calls, setting up interviews with local proponents and juggling our schedule so we could hit all the small communities by rented mini van before the event. 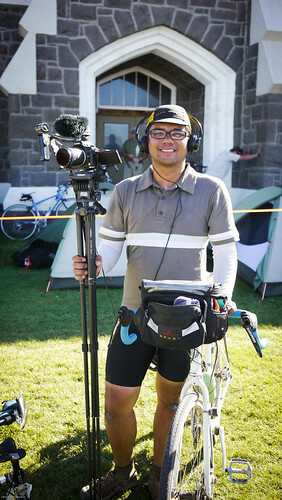 I was busy testing out video gear, trying to reduce things to the bare functional minimal I would need since I would be carrying everything by bike. In three days we drove the entire route, stopped at all the communities, shot some B-roll, interviewed the local proponents and then circled back to the beginning. THEN, the actual ride started. It was our first CycleOregon so we had to get over the initial shock of the sheer enormity of the ride and get to work. 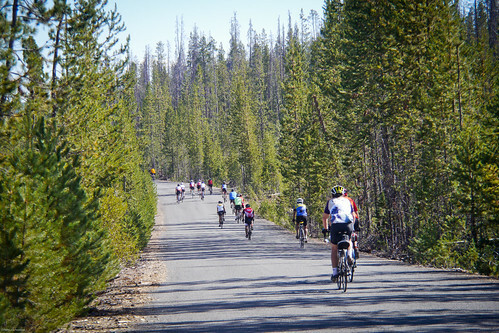 It was also proving to be one of the toughest CycleOregon routes in the history of the ride with 35,000 feet of climbing over the week. Our daily schedule consisted of getting up at 5:30am while it was dark and literally freezing outside. 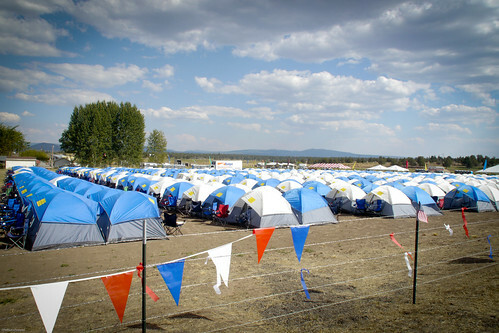 We would quickly take down our tent, shove things in our duffle bags and carry them to the luggage drop. Then it was a mad rush to shove hot breakfast foods down the gullet so we could shoot B-roll of people rolling out of camp. We’d ride hard everyday, trying to stay in the middle of the pack, knowing that by the end of the day we would be coming in near the back because of all our filming stops. During lunch breaks and rest stops we’d shovel more food, barely taking a break before we were up and walking around trying to find willing cyclists and volunteers to interview. Then, more B-roll. We’d usually end up spending an hour at stops, longer than we usually would but we had to get footage. Victory at the finish line everyday was sweet but short lived. I’d stop to film the volunteers and riders coming in, while Laura went to luggage drop to find our bags with the tent. We’d quickly set up camp, stand in line at the shower, shoot more B-roll, eat dinner, shoot more B-roll, then go to sleep exhausted only to wake up at 5:30am to repeat the whole process. But as I’m learning, filming in someways is the easy part. It’s been about three months since we rode CycleOregon and nearly everyday I’ve been chipping away at editing the 18 hours of footage. It was a monumental task, our first video project of this length. 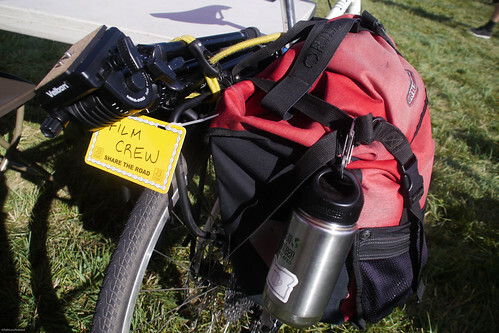 When Jerry Norquist from CycleOregon first asked us to ride and film the event, we were hesitant. It’s challenging enough to just ride the event, much less film it at the same time. But in retrospect, we are glad we said yes because it has been one of the toughest and most fulfilling projects we’ve taken on. So now we are done and the finished product is online. We learned a lot on the ride and after. When we first set out, I didn’t think it would be a 28 minute documentary, but that is what is has become. 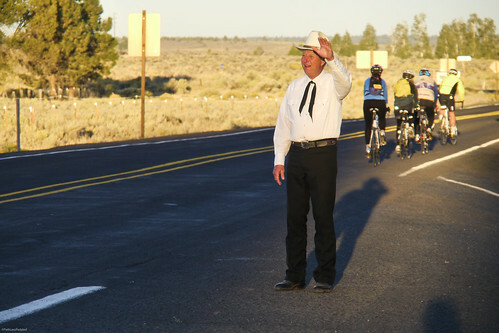 I’m proud of it and feel lucky to have been part of CycleOregon’s 25th anniversary ride and help tell their story. I also feel privileged to have spent time with the proponents from the small communities and to be able to share their voices. So sit back, grab a beer and some popcorn and enjoy. Terrific video. Ken Burns, watch out! I definitely want to do this ride. Great job Russ. I shared it with my cycling club via Facebook as several members have participated over the past 6 years or so (maybe more). At 7.19 minutes in you have a shot of John and Teri Caffery from our club here in So. Cal. I’d liked the focus of your film, the financial and social impact that the ride has on the communities it touches. And how the members of those communities touch the lives of the riders. Well done. I enjoy your website immensely. Care to share where you will be touring in January? Generally, you indicated it is the desert in So Cal. If you’re not wanting to tell more than that I understand. @David The plan so far is to take Amtrak to Paso Robles…perhaps spend a few days in the area interviewing bike friendly businesses then riding to SLO for a few days…then a train to San Diego then off to Anza Borrego/Joshua Tree/Palm Springs…. Beautiful film. Thanks for your blog this year. Best wishes for the holiday season. Looking forward to hearing more from you guys in the new year. Great documentary! I liked the focus on the revitalization of small towns. I’d love to do this ride in the future. Job very well done, Russ and Laura! nice video on CO. I’ve ridden 2: Hell’s Canyon, likely the coldest, wettest one they ever did, and a tough Crater Lake one, where I used my bike shoes as brakes too many times. You captured what makes it such a wonderful event. It really is much more than just a bike ride. Maybe some day I’ll ride it on my Brompton. Well put together video, Russ! 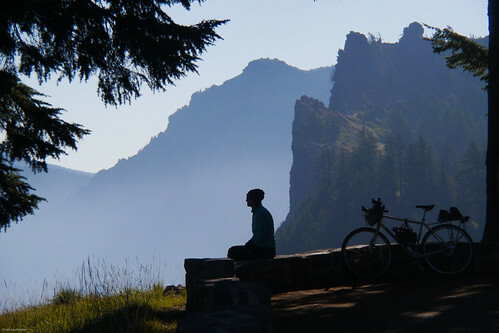 I’d love to do a Bike Oregon. Not likely to be in the right part of the country, at the right time. However, regardless of that, I’m definitely going to pay a visit to Bly. Looks like a wonderful little place! I might do a couple of the 2012 stages, myself (which I found all the GPS routes on RideChronicles.com). Crater Lake looks interesting!